Simone Thomas, wife of retired astronaut Dr. Don Thomas, addresses a slide presentation on entitled “An Astronaut Wife’s Life,” during the Wapakoneta Rotary Club’s noon lunch meeting held at the Wapakoneta Eagles on Monday. WAPAKONETA — Simone Thomas, wife of retired astronaut Don Thomas, detailed the development of the Astronaut Wives Club and her family’s relationship with Neil Armstrong Monday. Thomas’ presentation, “An Astronaut Wife’s Life,” was presented by the Auglaize County Library to celebrate the 50th anniversary of the Apollo 11 moon landing. 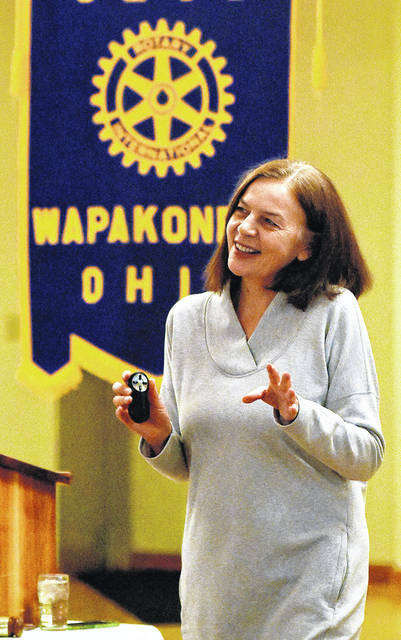 She spoke at noon at the Rotary Club meeting and again at 7:30 p.m. at the Wapakoneta library. Thomas discussed the history of the Astronaut Wives Club and how their lives were detailed by the media because it was the closest the public could come to the astronauts. Following the Challenger explosion in 1986, NASA drastically changed the media access to the spouses after family reactions were captured. The Astronaut Wives Club has now morphed into the Astronaut Spouse Group, and is recognized as a NASA institute. The spouses are now housed in a separate area away from the media during launches, Thomas shared. “In Don’s first mission, it was more like NASA would tell me where I have to be, and now it’s more teamwork,” Thomas said. “For the launch, every spouse deals with it differently, but in principal, right before launch, it’s stressful. The first time the Thomases met Neil Armstrong was the day before launch of the STS-83 in 1997. Don, a Cleveland native, had written Armstrong a personal letter inviting him to the launch, to which Armstrong responded. “I’ve met Neil Armstrong a couple of times, and I found him very fascinating,” Simone said. “He’s a worldwide celebrity and he’s completely down to earth and the nicest person.